Sanden Totten and Angela Kim sit in the car parked outside of the Art Shanties Project, preparing to go outside into the cold. Angela Kim: Ok you have your gloves? Sanden Totten: Yeah. So you've got your scarf? Angela: Yeah, I got my scarf. Angela: And I have my windproof fleece. Sanden: Did you put on long underwear? Angela: But I have knee-high socks though. Angela: Is that going to work? Sanden: So there definitely is a little bit of a breeze. Sanden: Okay, so you see up there in the distance...those are the art shanties. Angela: They look like colorful shacks. Sanden: It's like a little village. I see about 20 little shacks. Angela: Let's go into a shack. My nose is running. It's very cold. Peter: Good. How's it going with you? Sanden: Good. So where are we? Peter: I'm Peter Haakon Thompson and this is the Auto-Ethnographic Guide-Service Headquarters. Sanden: So this is sort of the headquarters for this little shanty village? Peter: It's sort of the information, administrative center, yes. Sanden: So we just got here. Angela: This is my first time here actually. I've never�I've only been here for a year. Sanden: Ok, now a little bit of background information. Angela Kim is from Los Angeles, a place where, not only do they not have art shanties, they don't even have winters. So all of this is new to her. Angela: We kind of have winters. It gets a little cold. Sanden: like sweater weather. Maybe. Hoodie weather. I don't think that counts. Angela: So I'm kind of curious, for a newbie like me who's never come to something like this, what do you suggest that I see? Peter: Every single shanty in the art shanty village. Sanden: Okay, Angela, we're going back out. Angela: Okay, here we go. Caleb: Hello my name is Caleb Peterson. 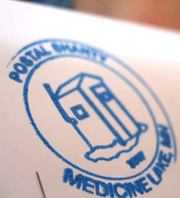 I'm one of the co-operators of the postal shanty out here on Medicine Lake at the Art Shanties Project. So this is it. We serve as both recipient and sender of mail from out here on the ice. Angela: Why do you think the postal shanty is necessary here? Like you can probably go to a post office close by. Caleb: I think it's an extension of the communal feeling you have out here on the ice. This is a community of like-minded individuals not unlike those who have, for several years here in the state of Minnesota, have gone out onto the ice, fishing, actually for fish. This is sort of an artistic expression of that community and any community needs a communication center and a postal office. Angela: Thanks. Okay, let's go to...what's next? Man: -- this is my first time at the Art Project. Angela: So far what have you seen? Tell me some of the stuff that you've seen. Man: Well, there's a large rocking robot that you can climb into. There's a large dark house that has a little pinhole in it and when your eyes adapt to the dark you can see an outline of the shore. It's one of those camera obscura things. Then there's a knitting house somewhere which I need to see because my wife knits. I think I might wander back over there and see what that's like. Angela: oh my God. I almost fell! Here I go, I'm okay now. Angela: Let's go into that one. Sanden: That's the Shanty of Misfit Toys. Marlaine: Do you want me to explain what this shanty looks like? Okay, so the Shanty of Misfit Toys has clear plastic walls and within the walls are about a thousand stuffed animals. So the animals act as insulation. I'm not quite sure what makes them misfit, maybe they're last year's models or there's something a little off like the little elephant. Maybe the eyeballs are a little bit tilted and aren't exactly right. And then there's a monkey that has a really weird screech to it. We call it the anxiety producing monkey. Marlaine: See that doesn't sound very comforting. I'm Marlaine Cox, this is our second year of doing the Shanty of Misfit Toys. I think the Art Shanty Project is a really great way to look forward to the winter, which I thought I'd never do. Because it just forces you to be outside and really embrace winter and all that it has to offer. Angela: I'm glad I came out here. Angela: It shows that there's life outside of winter because every time I look out my window I don't see people on my sidewalks. I don't see people on the streets in downtown St. Paul. Sanden: Maybe they're all at the art shanties, Angela. Angela: Maybe. I have to say people were really friendly out here. Like everyone talking to you. Sanden: Here it's sort of like everyone has this thing in common. You know, that they're doing this crazy thing. Hanging out on a lake. Angela: Also, the commonality of being out in the cold together. Sanden: That's like the unifying thing about Minnesota, we can always talk about how cold we are. Sanden: No seriously it's cold! much enjoyed! i just ret'd from a short visit to St Cloud, Mn where my 92 yr old mother is living in a nursing home. I so miss days on the ice in 'fish houses' and the communites created. As a little girl, I would ice skate to many such ice houses occupied by serious fishermen. I'd knock and ask how they were doing hoping for a treat of a stick of juicy fruit gum. During a country drive, we witnessed many small 'towns' of ice houses fondlh bringing these memories to the surface. My southern Calif. friends may now have a better understanding of the tough northerners! How lovely it was to have you out there, Angela and Standen! I hope your ankle is doing well.